A new paper published in the Journal of Atmospheric and Solar-Terrestrial Physics finds that polar Sudden Stratospheric Warmings [SSWs] cause strong cooling near the surface of the entire tropics. Sudden Stratospheric Warmings have in turn been associated either directly or indirectly to solar activity [via solar effects on stratospheric winds]. According to the authors, "The study reveals the presence of a strong cooling in the entire tropics (30°N- 30°S) associated with sudden stratospheric warmings" and "The near-surface (1000 hPa) temperature anomalies are also found to decrease during the peak of warming. A tropical upwelling is started in the tropical tropospheric layers prior to the peak of warming. The above upwelling induces a marked decrease in temperatures at 1000 hPa [near-surface] level." 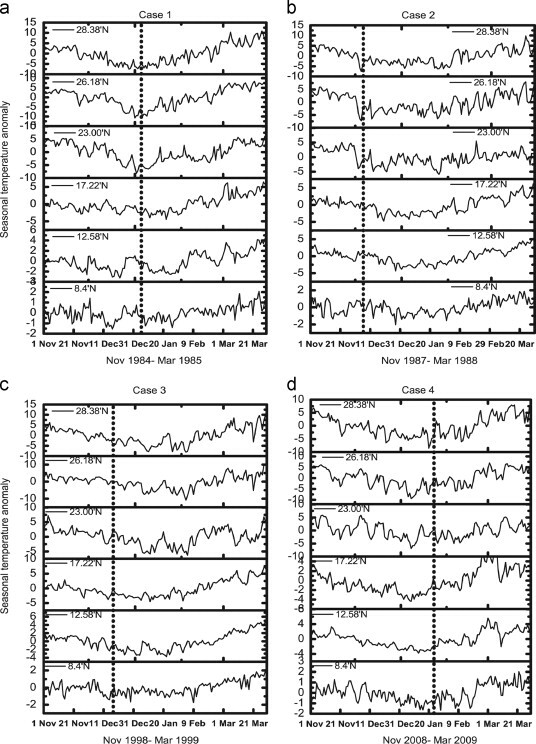 The paper may demonstrate yet another amplification mechanism by which tiny changes in solar activity can be amplified to produce large effects upon surface temperature. Fig.10. The surface temperature anomaly of the six Indian stations is represented for (a) 1984/85, (b) 1987/88, (c) 1998/99 and (d) 2008/09 [SSW] events. The dotted lines represents the peak day of each warming. The peak days detailed in Table 1 for 10 hPa level are denoted with dotted lines. Sudden stratospheric warming event induces a lower temperature gradient over the tropical (30N-30S) upper stratospheric layers. Over six Indian stations, the upper stratospheric seasonal temperature minimum is coinciding with the annual minimum values. The near-surface (1000 hPa) temperature anomalies are also found to decrease during the peak of warming. A tropical upwelling is started in the tropical tropospheric layers prior to the peak of warming. The above upwelling induces a marked decrease in temperatures at 1000 hPa level. Polar and tropical stratosphere is known to undergo coupling during the stratospheric sudden warming (SSW) during winter. This coupling effect is studied over the different locations of India based on four typical cases of major warmings that has occurred in the years 1984–85, 1987-88, 1998-1999 and 2008-09. The analysis has been carried out using the ECMWF interim reanalysis data from 1000 hPa to 1 hPa levels. The six Indian stations extending from northern to southern regions were selected to study the effect of SSW over Indian subcontinent. The study reveals the presence of a strong cooling in the entire tropics (30°N- 30°S) associated with SSWs. Over the Indian region, the cooling became intense of the order 10–15 °C during the peak phase of the warming. The intensity of the cooling is computed based on the deviation from the mean values. The temperature during such occasions attains the lowest values of the season or the year. The near-surface (1000 hPa) temperature anomalies over the Indian regions also exhibit a lower temperature prior to the peak of high latitude warming. Before the peak of warming, an upwelling started in the tropical tropospheric layer that induces a lower temperature in the surface layer. Thus the cooling first appears in the lower surface layers. When the polar stratosphere attains the maximum temperature, the tropical stratosphere shows the annual minimum temperature. It indicates the existence of a strong coupling between the low and high- latitudes associated with SSWs. The possibility of a severe cold stratosphere over the tropical Indian region can be anticipated when a major warming develops over the polar region. The sudden strong cooling of the tropical stratosphere appears to alter the prevailing dynamical and radiative processes in the troposphere and lower stratosphere. Changes in stratosphere temperatures from solar effects (over centuries) and from sudden stratospheric warming events (days or weeks) alter the gradient of tropopause height between poles and equator. The consequence is latitudinal shifts in the global air circulation which alter albedo by changing cloud amounts. We are seeing paper after paper coming out consistent with such a scenario. Surely someone in a position of authority will join the dots? Thanks Steven perhaps Roy Spencer? Tried Roy a while ago but he didn't pick up on it. Will just have to hope it eventually becomes obvious to all.